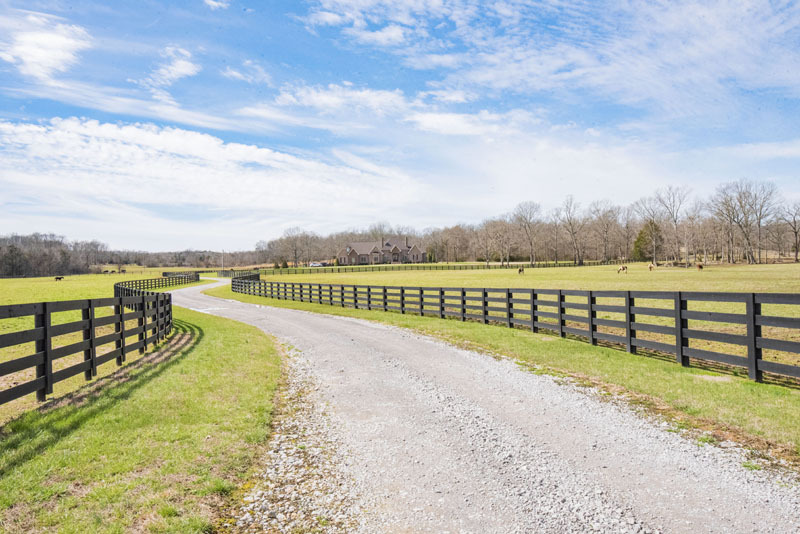 Outdoor people at heart, it is no surprise the Barkers’ wants and needs included lots of land and plenty of room for a little farm to serve as a home base to not only their family, but also their four cats, four dogs and 17 horses. Animals are at the root of the family’s passion, both from a professional standpoint and a personal one, as Grey is the owner and operator of several small animal veterinary clinics in Murfreesboro, including the Barfield Animal Hospital. Additionally, the Barkers together enjoy basically anything outdoors — and if any given outdoor activity includes one of their beloved pets, that’s icing on the cake. “Animals are extremely important to our family,” Grey said. “They bring us extreme joy. I absolutely love having the opportunity to work with them on a daily basis both as a veterinarian and an owner. My wife and I often joke that our lives would be quite boring if not for our animals.” From a professional standpoint, Grey says he feels grateful to live and work in a place he loves.“I consider myself very blessed to do a job that I love in such a wonderful town,” he said. “Murfreesboro is a great place for friends, church fellowship and family activities.” Grey is a native Tennessean. Born in Humboldt, he has spent his entire life in the Volunteer State. He attended the University of Tennessee in Knoxville where he completed his Doctor of Veterinary Medicine degree. While at UT, Grey was a member of the Volunteer football team and was twice selected to the academic all SEC team. Making their home in Murfreesboro, Tennessee, Grey met wife Rhiannon many years ago in Middle Tennessee, from where she is a native and continues to play an active role in her hometown community, especially through her role as a math teacher at a Rutherford County school. “One interesting fact is that my wife and I actually met at a horse show while showing horses, and horses continue to be a hobby that we enjoy together,” he said. Life is indeed busy for both Grey and Rhiannon and their children, daughter Lillian, 8, and fifth generation son Harold Grey, 12. Whether it’s any given sporting event such as basketball or even gymnastics, riding horses or other fun activities outdoors, there’s not much grass between any of the Barkers’ feet and the ground. As life progressed and the kids started getting older, Grey said they began the journey of building their dream home, which included a farm and lots of acres without getting too far out of town and the conveniences it provides. Although the finishing touches on their barn are still a work in progress, the Barkers now have everything they hoped for in a home on Carlton Road in Christiana. The large and spacious custom home built by Shane McFarland, whom Grey learned about via word of mouth, has everything the family needs and loves, with designer Kristen Taylor assisting them along the whole journey from start to finish as their go-to gal for all things interior design. “Location was the most important thing to us,” Grey said. “What we have is a simple, one level, wide open and beautiful home, inside and outside. The view here is amazing.” Comfortable and inviting, cozy yet regal; the Barker home is light and airy on the inside and on the outside, guests will delight in a scene that features lush, green pastures and an inviting backyard. The back porch — it’s one anyone would love to sit back and sip lemonade on, for when the sun sets in the backyard it’s like coming home. The kids go to school in Eagleville, and so the Christiana address puts them in a prime spot that’s halfway between school and Murfreesboro, much to the delight of the busy working parents. There’s little down time for the Barkers, with weekends including horse-related activities, friends, games and fun outdoor pursuits. Kicking their schedules up a notch, the weekdays are even more hectic; each member of the family definitely has their own duties and responsibilities to keep the flowing moving smoothly. Once all the feeding is done, Grey and Rhiannon work together getting the kids ready and off to school followed by both heading to work before taking on shift number two of the day with all the afternoon and evening activities. “Rhiannon usually handles the gymnastics stuff and I usually do the basketball,” he said. “Then, if we are lucky, we all try to end the day together with hopefully a home-cooked meal.” Though nearly 20 horses may seem like a huge undertaking, Grey says both he and Rhiannon love having them — they actually met at a horse show — and can’t imagine not having them occupying the beautiful pastures on their peaceful country haven. Whether it’s work or play, animals, nature, friends and fun are pretty much the most important parts of the Barker family’s lives. The fact that they are able to do all of those things in and around their lovely home makes it the place they hope to be for many, many years to come.